In signing the bill, Governor Schwarzenegger stated, "We can now move forward with developing a market-based system that makes California a world leader in the effort to reduce carbon emission. The success of our system will be an example for other states and nations to follow as the fight against climate change continues. AB 32 strengthens our economy, cleans our environment and, once again, establishes California as the leader in environmental protection." "By the will of the people, the governments of King County and Seattle have become national leaders in developing global warming solutions. We're here today to show that the individual efforts of all of us add up quicker than you think and can have a tremendous impact—right now. . . . I congratulate Ballard and challenge other neighborhoods to follow suit." For example, the Chicago urban tree canopy removes 15 metric tons of carbon monoxide, 84 metric tons of sulfur dioxide, 89 metric tons of nitrogen dioxide, 191 metric tons of ozone and 212 metric tons of particulates each year, according to David Nowak, project leader of the U.S. Forest Service's Urban Forest Ecosystem Research Unit. Sacramento, California, planted more than 200,000 trees around the city in the mid-1990s. Greg McPherson of the Western Center for Urban Forest Research found that the region's urban forest removes more than 200,000 metric tons of carbon dioxide from the atmosphere each year, saving taxpayers as much as $3 million annually in pollution cleanup costs. According to the United States Department of Agriculture, “Soil is the largest terrestrial global carbon pool, estimated to be about one-and-a-half trillion tons.” However, farming practices have severely depleted soils' organic carbon levels in many agricultural areas. Grasses or trees planted along streams and croplands to prevent soil erosion and nutrient runoff into waterways. 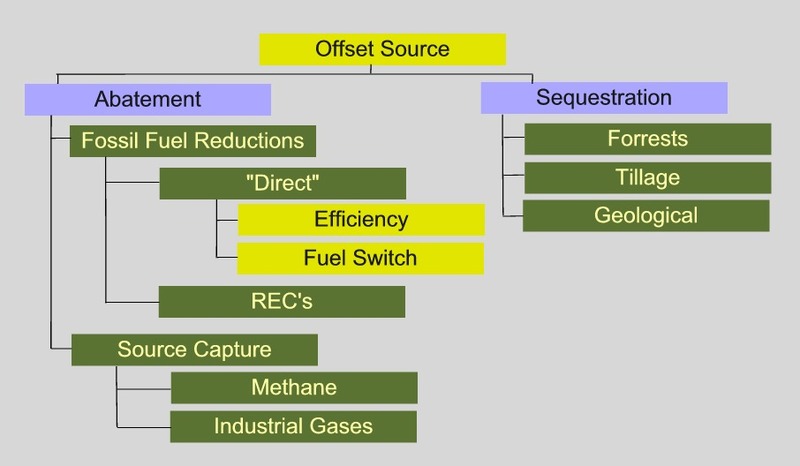 Increases carbon storage through sequestration. Typically defined as any tillage and planting system in which 30% or more of the crop residue remains on the soil after planting. This disturbs the soil less, and therefore allows soil carbon to accumulate. There are different kinds of conservation tillage systems, including no till, ridge till, minimum till and mulch till. Increases carbon storage through enhanced soil sequestration, may reduce energy-related CO2 emissions from farm equipment, and could affect N2O positively or negatively. Modification to grazing practices that produce beef and dairy products that lead to net greenhouse gas reductions (e.g., rotational grazing). Increases carbon storage through enhanced soil sequestration and may affect emissions of CH4 and N2O. Hamilton, Katherine (2006) "Navigating a Nebula: Institutional use of the U.S. Voluntary Carbon Market" Master’s Thesis. Yale School of Forestry and Environmental Studies. Archived at: www.climatemanual.org/Cities/Chapter5/ReducingImpact/Hamilton_USVoluntaryMarket.pdf, 5 December 2006. Source: Bayon, R., Hawn, A., and K. Hamilton (December 2006) Voluntary Carbon Markets: An International Business Guide to What they are and How they Work, Earthscan. Point Carbon “Carbon Market Analyst: Carbon Trading in the U.S.: The Hibernating Giant.” 13 September, 2006, www.pointcarbon.com/, 5 October 2006. Judy Li “Governor, Democrats reach pact” The Sacramento Bee, Thursday, August 31, 2006, Page A1. Press conference at the National Governors’ Association Meeting Feb 2006, 216.239.59.104/search?q=cache:Rq87W1n0RsMJ:www.governor.state.nm.us/press/2006/feb/022806_01.pdf+New+Mexico+climate+initiative&hl=en&ct=clnk&cd=6&gl=us&client=safari, 15 January 2007. Chicago Climate Exchange, www.chicagoclimatex.com, 5 October 2006. A directory of retail offset sellers and description of various certification programs is included in: Bayon, R., Hawn, A., and K. Hamilton (2006) Voluntary Carbon Markets: An International Business Guide to What they are and How they Work, Earthscan. Bayon, R., Hawn, A., and K. Hamilton (2006) Voluntary Carbon Markets: An International Business Guide to What they are and How they Work, Earthscan. Green Power Partnership website, www.epa.gov/greenpower/, 3 May 2006. NetGreen website, www.achievenetgreen.org/, 5 October 2006. The Climate Trust, www.climatetrust.org/, 5 October 2006. “Local Leaders Pledge to Make Ballard First ‘Carbon Neutral’ Community in the United States.” SeattleDaily Business News, 4 October, 2006. Stoner, Edward. “The Town of Vail goes all wind power too.” Vail Daily. 7 August, 2006. Vail resorts website, www.vailresorts.com/, 5 October 2006. “TOV 100 Percent Powered by Wind” Press Release, 15 September 2006. ci.vail.co.us/release.asp?r_id=2856, 5 October 2006. Some scientists challenge the idea that planting forests outside of the tropics helps reduce global warming, pointing out that forests trap more heat than they get rid of by sequestering carbon. However, in cities, planting and maintaining trees does appear to be a net reduction of global warming. For more information, environment.guardian.co.uk/climatechange/story/0,,1972729,00.html, 15 January 2007. American Forests website: www.americanforests.org/, 5 October 2006. The Urban Forest Network Newsletter, http://www.thefreelibrary.com/Parks+as+Lungs-a079575245, “Parks as Lungs” by Roddy Scheer, 11 April 2007. Art Rosenfeld, et al, “Policies to Reduce Urban Heat Islands,” LBL 38679, Lawrence Berkeley National laboratory, 1996, and Rosenfeld, “The Art of energy Efficiency,” Annual Review of Energy and Environment 1999. City of Boulder Climate Action Plan. 161.98.15.236/files/Environmental%20Affairs/climate%20and%20energy/cap_final_14aug06.pdf#search=%22Boulder%20Climate%20Action%20Plan%22, also archived at, www.climatemanual.org/Cities/Chapter5/ReducingImpact/Boulder_CAP_14aug06.pdf, 5 October 2006. Cambridge Climate Protection Plan, www.ci.cambridge.ma.us/cdd/et/env/clim_plan/clim_plan_full.pdf, also archived at, www.climatemanual.org/Cities/Chapter5/ReducingImpact/Cambridge_ClimatePlan.pdf, 5 October 2006. City of Minneapolis 2004 Environment Report, www.ci.minneapolis.mn.us/environment/docs/MPLSEnvOverview071604.pdf, also archived at, www.climatemanual.org/Cities/Chapter5/ReducingImpact/Minneapolis_CAP.pdf, 5 October 2006. USDA Agricultural Research Service, www.ars.usda.gov/research/, 5 October 2006. Also in this manual, see Chapter 5, Long Term Initiatives, Sustainable Agriculture section. See Dan Dagget, Gardeners of Eden, Tarcher, 2005. EPA Carbon Sequestration in Agriculture and Forestry, www.epa.gov/sequestration/ag.html, 4 October 2006. Hamilton, Katherine. “Testing the Waters: The Great Miami River Watershed Water Quality Credit Trading Program.” The Katoomba Group Ecosystem Marketplace. September 2006.